Hednesford travel to face King's Lynn Town this afternoon with Archie having signed in time yesterday to allow him to feature. It won't be his first FA Cup debut either. Last season he spent time on loan with Halifax and made his debut for them last November as a substitute in the 1st round of the competition at MK Franchise, a game they lost 4-1. He returned to Turf Moor at the end of 2013 and remained with the development squad for the remainder of the season before leaving the club, another of the 2011/12 FA Youth Cup semi-final team to depart the club. He's one of four former Burnley players to find themselves new clubs during September and two of them were players who featured in our first team last season. We reported recently that Brian Stock has returned to the south coast and joined Conference South club Havant & Waterlooville managed by former Bournemouth boss and friend Lee Bradbury. Stock has settled in well and has already played four games for his new club. 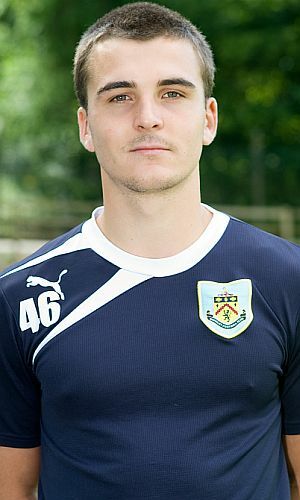 In January of this year the Clarets released young striker Ryan Noble after a half season contract. He signed for Gateshead but failed to impress and was released at the end of last season. He then signed for Darlington 1883 at the beginning of September. He made his debut in a 2-1 league defeat at Droylsden on the 6th this month and was still awaiting his first goal for his new club, who are managed by former Sunderland midfielder Martin Gray who said he would add quality in the box. Last night, however, Noble was on the move again less than a month after joining Darlington. He's now signed for Durham City just three weeks after making that Darlington debut and could get his first start for his new club today against Celtic Nation in the FA Vase. One other player on the move this month is former youth team midfielder Oliver Devenney. Now 22, he's played for Clitheroe and FC United of Manchester since leaving Burnley and has now transferred from Nantwich Town to Mossley.